Aboriginal Science Fiction was a high-circulation semi-professional science fiction magazine started in October 1986 by editor Charles Ryan. After releasing 49 issues it ceased publication in the spring of 2001. In 2002 the rights to Aboriginal Science Fiction were acquired by Absolute Magnitude . Absolute Magnitude is a discontinued, semi-professional science fiction magazine started in 1993 under the name Harsh Mistress. However, in 1994 after only two issues the name was changed to Absolute Magnitude. In 2002 the name was changed again to Absolute Magnitude & Aboriginal Science Fiction when the publishers acquired the rights to Aboriginal Science Fiction. Absolute Magnitude was published by DNA Publications and edited by Warren Lapine. Although it was supposed to be a quarterly magazine its actual releases were irregular. After releasing twenty-one issues under the Absolute Magnitude title, the magazine ceased publication in March 2006. At that time there was Analog, and Asimov's, and Amazing, which had all been around for a while. We looked at those names and realized that newer authors -- the people we wanted to focus on -- would use one of two methods to choose who they'd submit to. Some writers would submit first to whoever paid the most, but there are lots of others who just go through the list alphabetically, so we wanted a name that would put us near the front of the market list. First I thought of "Aardvark", but then I thought I remembered a fanzine with that name and I didn't want people to get confused. Then we thought of "Aboriginal", and came up with this whole story about an alien anthropologist who'd been sent to Earth to study the indigenous population -- the Aboriginals -- and got so intrigued by science fiction that he started to beam it back as part of his reports to his home world. So each issue of the magazine was supposed to be one of these field reports, which we'd intercepted and printed up. Sure, it was a cornball gimmick -- but it worked! In 1988 Absolute Entertainment, Inc. released an 80-page anthology called Aboriginal Science Fiction 1988 Annual Anthology which contained twelve stories from earlier issues of the magazine. Among the many illustrators for this magazine was Film Maker Larry Blamire. Larry Blamire is an American filmmaker, writer and artist best known for the independent film The Lost Skeleton of Cadavra. Dragon is one of the two official magazines for source material for the Dungeons & Dragons role-playing game and associated products; Dungeon is the other. Skeleton Crew is a collection of short fiction by American writer Stephen King, published by Putnam in June 1985. A limited edition of a thousand copies was published by Scream/Press in October 1985 (ISBN 978-0910489126), illustrated by J. K. Potter, containing an additional short story, "The Revelations of 'Becka Paulson", which had originally appeared in Rolling Stone magazine, and was later incorporated into King's 1987 novel The Tommyknockers. The original title of this book was Night Moves. 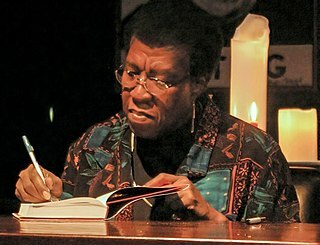 Octavia Estelle Butler was an African-American author of science fiction. A multiple recipient of both the Hugo and Nebula awards, she became in 1995 the first science-fiction writer to receive a MacArthur Fellowship. Carolyn Janice Cherry, better known by the pen name C. J. Cherryh, is an American writer of speculative fiction. She has written more than 80 books since the mid-1970s, including the Hugo Award-winning novels Downbelow Station (1981) and Cyteen (1988), both set in her Alliance-Union universe. She is known for "world building," depicting fictional realms with great realism supported by vast research in history, language, psychology, and archeology. Her series of fantasy novels set in the Alliance-Union universe, the Morgaine Stories, have sold in excess of 3 million copies. Skeptical Inquirer is a bimonthly American general-audience magazine published by the Committee for Skeptical Inquiry (CSI) with the subtitle: The Magazine for Science and Reason. In 2016 it celebrated its fortieth anniversary. For most of its existence, the Skeptical Inquirer (SI) was published by the Committee for the Scientific Investigation of Claims of the Paranormal, widely known by its acronym CSICOP. In 2006 the CSICOP Executive Council shortened CSICOP's name to the Committee for Skeptical Inquiry (CSI) and broadened its mission statement. Omni was a science and science fiction magazine published in the US and the UK. It contained articles on science, parapsychology, and short works of science fiction and fantasy. It was published as a print version between October 1978 and 1995. The first Omni e-magazine was published on CompuServe in 1986 and the magazine switched to a purely online presence in 1996. It ceased publication abruptly in late 1997, following the death of co-founder Kathy Keeton; activity on the magazine's website ended the following April. Alien Nation is a 1988 American buddy cop neo-noir science fiction action film directed by Graham Baker. The ensemble cast features James Caan, Mandy Patinkin and Terence Stamp. Its initial popularity inaugurated the beginning of the Alien Nation media franchise. The film depicts the assimilation of the "Newcomers", an alien race settling in Los Angeles, much to the initial dismay of the local population. The plot integrates the neo-noir and buddy cop film genres with a science fiction theme, centering on the relationship between a veteran police investigator (Caan) and an extraterrestrial (Patinkin); the first Newcomer detective. The duo probe a criminal underworld while attempting to solve a homicide. Charles Lewis Grant was an American novelist and short story writer specializing in what he called "dark fantasy" and "quiet horror." He also wrote under the pseudonyms of Geoffrey Marsh, Lionel Fenn, Simon Lake, Felicia Andrews, and Deborah Lewis. 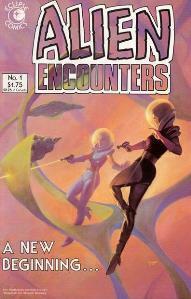 Alien Encounters is an American science fiction anthology comic book published by FantaCo Enterprises and then Eclipse Comics. The comic debuted with FantaCo in 1981, and in 1985 was revived by Eclipse, where it ran for fourteen issues until 1987. Eclipse began publishing the title soon after the cancellation of Alien Worlds, a similar science-fiction themed anthology. Howard Vincent Hendrix is an American scholar and science fiction writer. He is author of the novels Lightpaths and Standing Wave, Better Angels, Empty Cities of the Full Moon, The Labyrinth Key, and Spears of God. His early short stories are found in the ebook Mobius Highway. The Last Dangerous Visions is a mooted sequel to the science fiction short story anthologies Dangerous Visions and Again, Dangerous Visions, originally published in 1967 and 1972 respectively. Like the first two, it was scheduled to be edited by Harlan Ellison, with introductions provided by him. 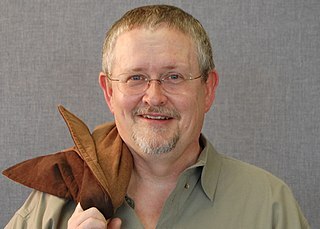 Orson Scott Card is an American novelist, critic, public speaker, essayist, and columnist. He writes in several genres but is known best for science fiction. His novel Ender's Game (1985) and its sequel Speaker for the Dead (1986) both won Hugo and Nebula Awards, making Card the only author to win both science fiction's top U.S. prizes in consecutive years. A feature film adaptation of Ender's Game, which Card co-produced, was released in 2013. "Breeds There a Man...?" is a science fiction short story by American writer Isaac Asimov. It was first published in the June 1951 issue of Astounding and was reprinted in science fiction anthologies such as Beachheads in Space (1952) and The Great SF Stories #13 (1951), as well as in Asimov-only collections such as Through a Glass, Clearly (1967), Nightfall and Other Stories (1969). and Robot Dreams (1986). Rhondi A. Vilott Salsitz, born in Phoenix, Arizona, is a writer of science fiction, fantasy, and mystery novels. Bruce McAllister is an American author of fantasy, science fiction, poetry, and non-fiction. He is known primarily for his short fiction. Over the years his short stories have been published in the major fantasy and science fiction magazines, theme anthologies, college readers, and "year's best" anthologies, including Best American Short Stories 2007, guest-edited by Stephen King. Clifford Donald Simak was an American science fiction writer. He won three Hugo Awards and one Nebula Award. The Science Fiction Writers of America made him its third SFWA Grand Master, and the Horror Writers Association made him one of three inaugural winners of the Bram Stoker Award for Lifetime Achievement. Timothy Robert Sullivan, who more commonly uses the name Tim Sullivan, is an American science fiction novelist, screenwriter, actor, film director and short story writer. Charles Hornig was one of the earliest contributors to the science fiction genre. He not only created one of the very first fanzines in 1933, as a teenager, he became the managing editor for Wonder Stories magazine from November, 1933 to April, 1936.